This War of Mine is an electronic video game developed by the 11 bit studios. The game’s background is inspired by the Yugoslav civil war and the siege of Sarajevo, which lasted four years in which approximately 5,000 mainly civilian civilians were killed (Kirkpatrick & Schiltz, 2016). What makes it special is that, unlike the other games that put the user in the position of warrior, this game puts him in the position of a citizen and the way he experiences a warring conflict having survival as his main concern (Noack, 2014). The player is called upon to manage the survival of a group of citizens through organizing the distribution of available resources such as fuel, food, water and medicine in particularly difficult situations that affect the mood and vitality of each member until a ceasefire is declared. The interaction required by the player does not stop only in pure survival and in finding resources, as he is asked to explore his / her own moral framework, being in charge of decisions and moves that affect the psychological situation and consequently the needs of the group handled. For example, he may decide to rob a couple of elderly people to save a member of his own team, but some of its members are so negatively affected by this choice to the point that the group can not function properly, leading some of up to suicide. The player is asked to walk in a stretched rope of balance and survival, experiencing horror, despair and the needs of people in war conditions. the player is called upon to develop his / her ability to make decisions in the light of the ethical issues that arise. It creates practices interacting with the environment of the game and learns through its own actions by remodeling its choices according to the mistakes it makes (Auberger, n.d.). 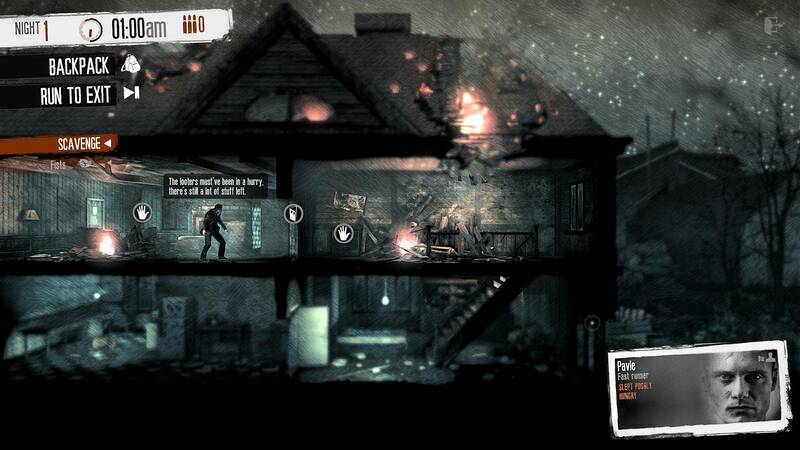 This War of Mine promotes reflection through the impact of achieving the goal of surviving, creating a sense of despair as the player's choices don’t affect the outcome of the war, as he is only tasked with the wellbeing of his team, a feeling experienced by any civilian who finds himself in the midst of a war (Toma, 2015). No matter what he does, people will lose their lives, and he is called upon to explore the point where the need for survival overlaps his moral and psyche. The game is available for personal Computers, IOS and Android devices. Noack, R. (2014) This war video game is not about the shooters. It's about the victims.Washington Post. November 21. Toma, E. (2015) Self-reflection and morality in critical games. Who is to be blamed for war? Journal of Comparative Research in Anthropology and Sociology. 6 (1), 209-224.